For two races in a row now, Lewis Hamilton has won Grands Prix that he arguably shouldn’t have. 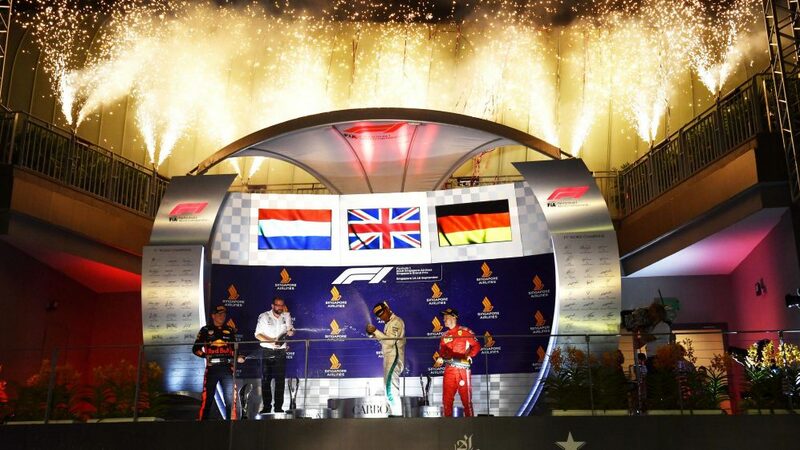 After stealing the Italian Grand Prix from under Ferrari’s noses, Hamilton produced another dominant display in Singapore, seeing off the challenge of Red Bull’s Max Verstappen to increase his lead in the title race over arch rival Sebastian Vettel, who could only finish third. Beneath the track’s 1,771 lights, Hamilton used his “magic” pole position from Saturday to great effect, leading off the line as behind him, the Force Indias came together, with Esteban Ocon finding himself out after just three corners. 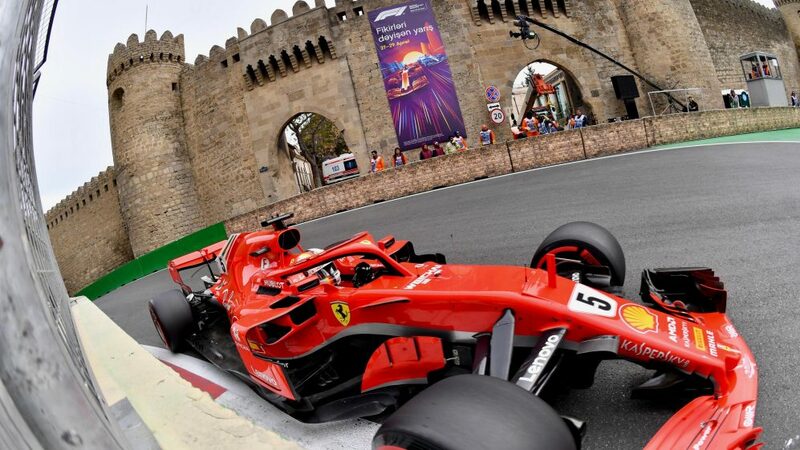 From then on, Vettel was in damage limitation mode, as he was forced to watch on as his 2018 championship hopes took a further hit. As the chequered flag fell on Hamilton’s 69th career win, the British driver earned himself 25 points to Vettel’s 15, the gap between them in the drivers’ standings now up to a full 40 points. Having suffered with a misfiring engine throughout the weekend, however, and after complaining of false neutrals in his gearbox at the start of the race, Verstappen was delighted to convert his second place in qualifying into the same position in the race – even if Red Bull had viewed Singapore as their last big chance of securing a win in 2018. Behind the podium finishers, Mercedes’ Valtteri Bottas just managed to hold off his fellow Finn Kimi Raikkonen for fourth place as Daniel Ricciardo, who’d come away from qualifying puzzled at his lack of pace, could only manage sixth. The second Renault of Nico Hulkenberg rounded out the top ten, but ultimately, once again they day belonged to Mercedes and Hamilton who once again triumphed on a track that was not expected to suit the W09. 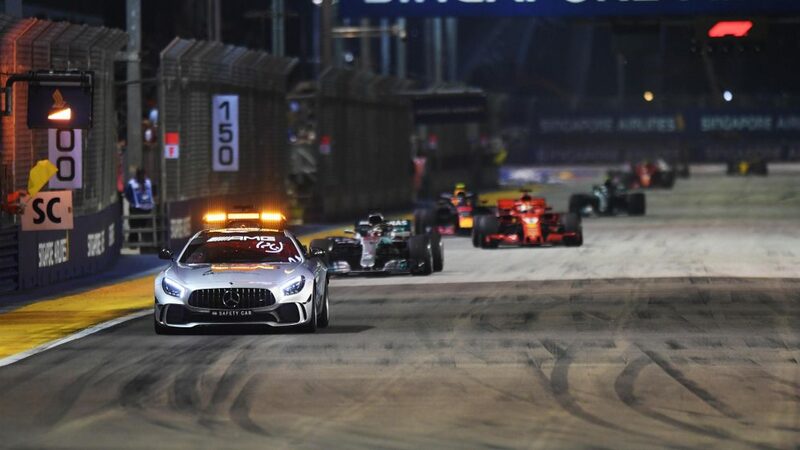 A Safety Car has been called out at each of the 10 previous Singapore Grands Prix – and it took just three corners for Bernd Maylander to get the nod this year. In contrast to 2017, the field filed fairly politely through Turn 1, Hamilton leading Verstappen and Vettel, the German having half tried a move around the outside of the Red Bull. But as the Force Indias navigated Turn 3, Esteban Ocon tried to go around the outside of Sergio Perez. 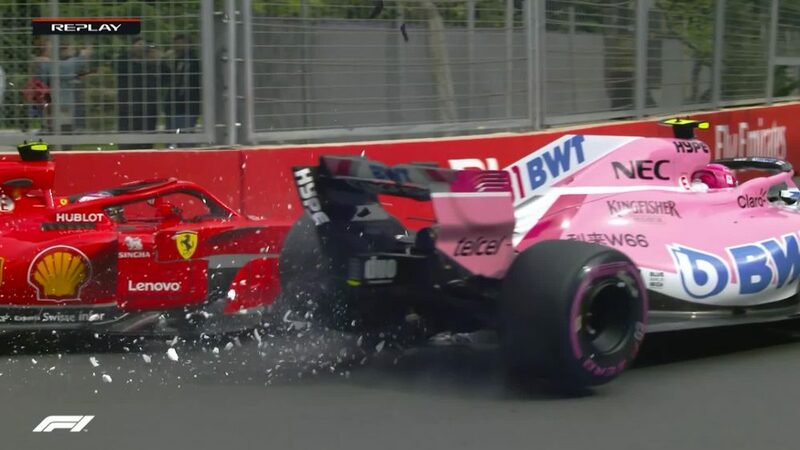 The gap closed and Ocon found himself spat into the wall, the Frenchman hinting afterwards that he felt his team mate had been at fault, even if the stewards cleared the Mexican. 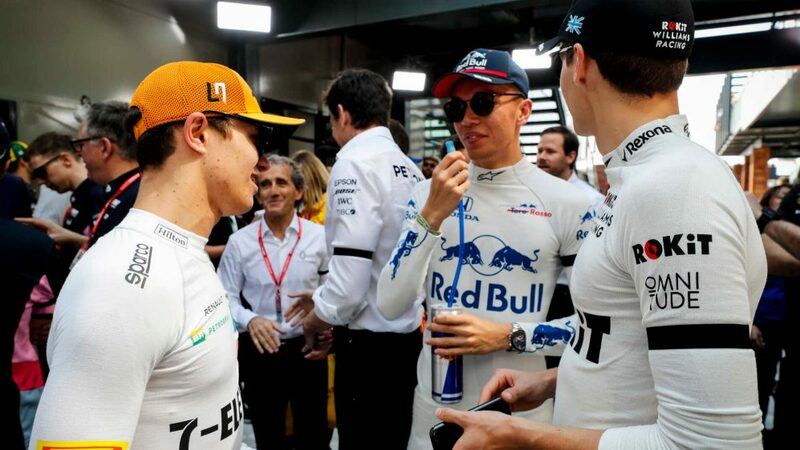 Either way, the Safety Car hit the track as Ocon’s VJM11 was recovered, but not before Sebastian Vettel had made it past Max Verstappen’s Red Bull heading down Raffles Boulevard. Hamilton managed the restart well at the end of lap four, gapping Vettel by 0.8s by the time he reached the start-finish line. But with all of the front-runners running on the hypersofts and desperate to keep the life in them, the first dozen laps were reeled off in what could best be described as a stately manner. On lap 12, Hamilton radioed to his pits. “There’s a lot left in the tyres,” he reported. Over on the Ferrari pit wall, they misheard the comment, reporting to Vettel that Hamilton had said he had no life in his tyres. “I don’t believe him,” was Vettel’s cool response. But were Ferrari rattled nonetheless? Vettel was brought in just two laps later, and put onto ultrasofts. Hamilton came in a lap after and bolted on softs, querying his team for bringing him in so early. “We’re looking good,” he was told by engineer Pete Bonnington. “We’re just covering the cars around us.” Hamilton emerged back into the net race lead, while Vettel was brought out into the path of Perez’s Force India. As if that wasn't bad enough, Vettel then suffered a further blow when Max Verstappen pitted for softs on lap 17, with the Dutchman coming out wheel-to-wheel with the Ferrari before moving ahead and sealing Vettel’s fate for the evening in the process, his victory chances in tatters with less than third of the race run. 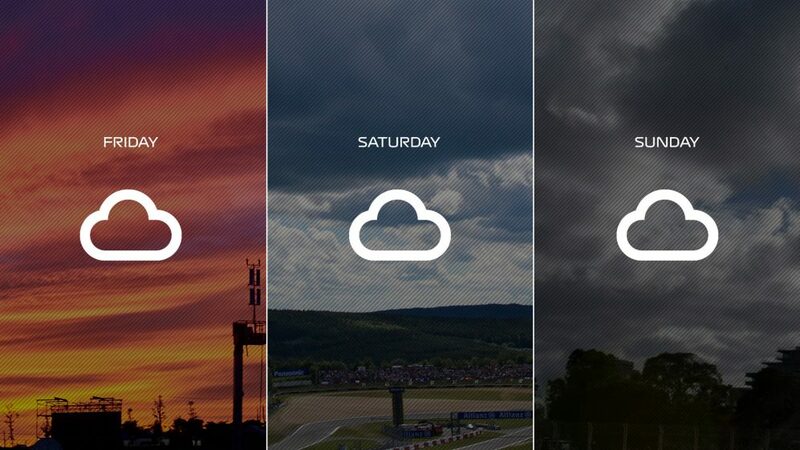 Were Ferrari paying dearly for a simple case of incommunicado? Did Perez push out Ocon? Further down the order, Perez found himself involved in more controversy. The Mexican had been frustrated at Force India’s own pit strategy, which had put him into traffic and bottled him up behind Sergey Sirotkin’s Williams. 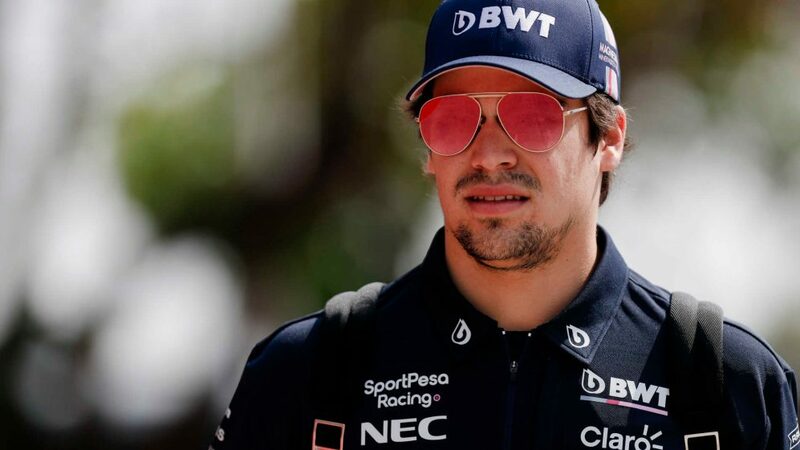 As Perez finally made it past the Russian on lap 33, he steered left into the Williams, puncturing his rear left tyre and receiving a drive through penalty in the process. 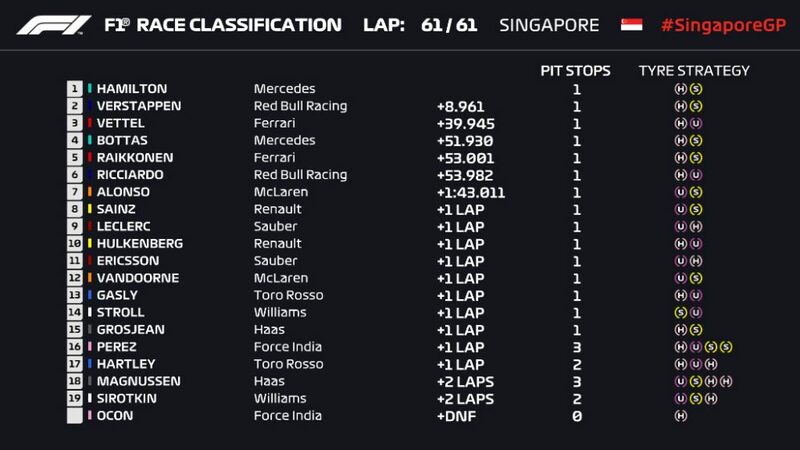 Perez, who'd finished every previous race he'd started at Singapore in the points, ended the day P16 having started seventh, in what was certainly not a classic day for the Force India. A few laps later, and Sirotkin nearly played an even more significant role in the race. As he stubbornly fought off the faster Haas of Romain Grosjean behind him, the leading cars of Hamilton and Verstappen closed in behind the warring duo. 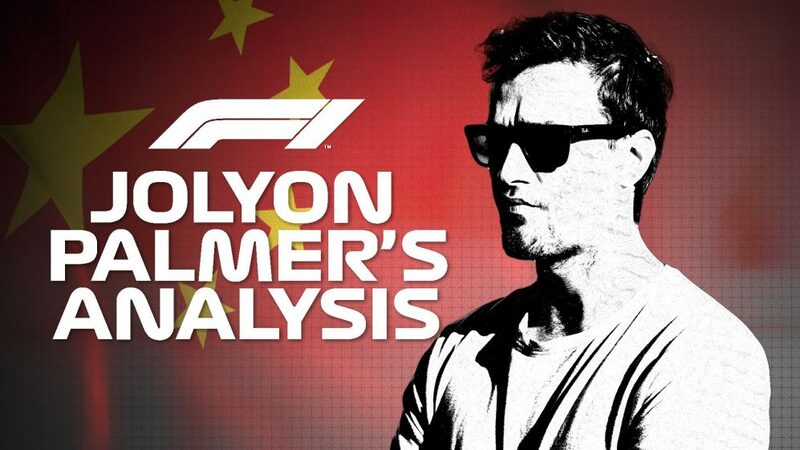 Although blue flags were shown, Grosjean and Sirotkin were too focused on their own battle, holding up Hamilton to the tune of five seconds and nearly allowing Max Verstappen to attack for the lead. Put it down he did, and as the order remained largely static in the race’s final act, Hamilton swept across the line nearly nine seconds to the good over Verstappen to record win number 69 of his career, with Vettel a further half a minute down the road. As the German grimly sipped from his magnum of champagne on the podium, it appeared as though, once again, questionable Ferrari strategy had left him unable to take the fight to Hamilton. 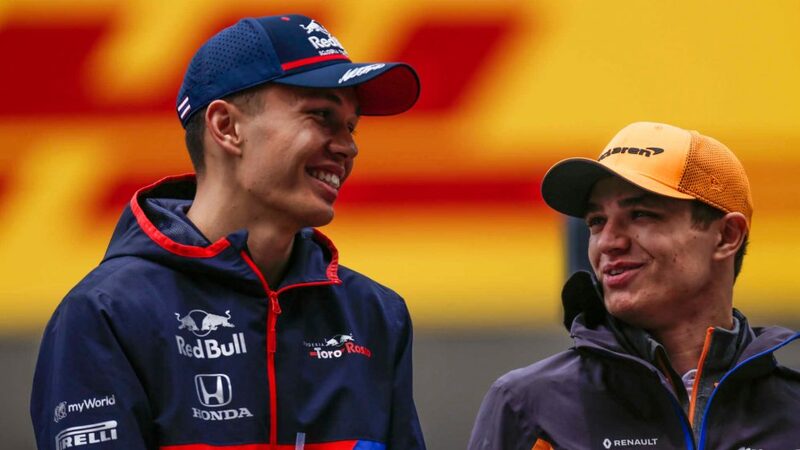 The gulf of 40 points between the two drivers, as they both seek to become five-time world champions, is now starting to look dangerously close to being unbreachable. Hamilton, meanwhile, offered a weary smile as he eventually clambered out of his Mercedes after an hour and 44 minutes racing in Singapore’s humid heat, with the Briton knowing that he’d just taken another chunk out of Ferrari on a weekend where his team had looked set to have the third quickest car of the field. It was the 44th win from pole for Lewis Hamilton, in car number 44. Hamilton has now finished first or second in the last six races. Max Verstappen maintained Red Bull’s record of finishing in the top two at every Singapore Grand Prix this decade. It was Sebastian Vettel’s seventh podium finish of his career in Singapore – but the first time he’s finished in third place. Raikkonen’s fifth place nets him his 1000th career point for Ferrari. This year marked the first time since Daniel Ricciardo became a Red Bull driver that he’s finished off the podium in Singapore. Alonso’s seventh place represents his and McLaren’s best finish since Baku in April. Prior to this year, Sergio Perez had scored points in each of the seven Singapore Grands Prix he’d competed in, despite never having qualified in the top 10. 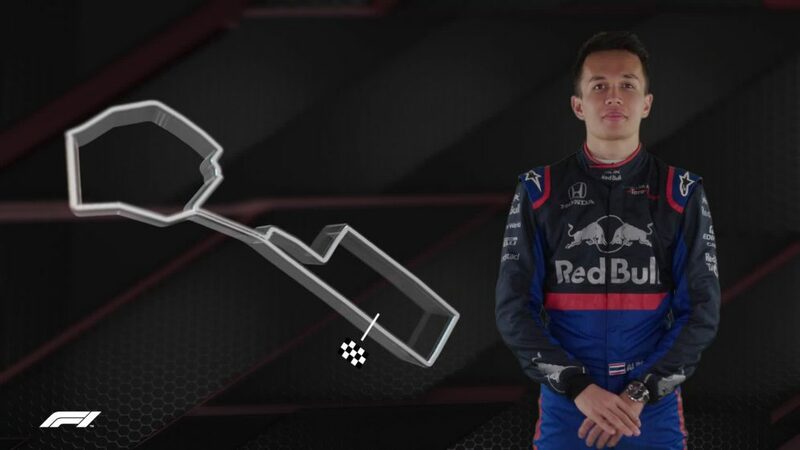 In 2018, he qualified in the top 10 – and finished out of the points. Charles Leclerc gave Sauber their ninth points finish of the season – matching their run from 2015. With nothing to lose running near the bottom of the order, Kevin Magnussen strapped a new set of hypersofts on and logged the first fastest lap of his career, Haas’ first fastest lap and the first fastest lap for a Danish driver in F1 history. 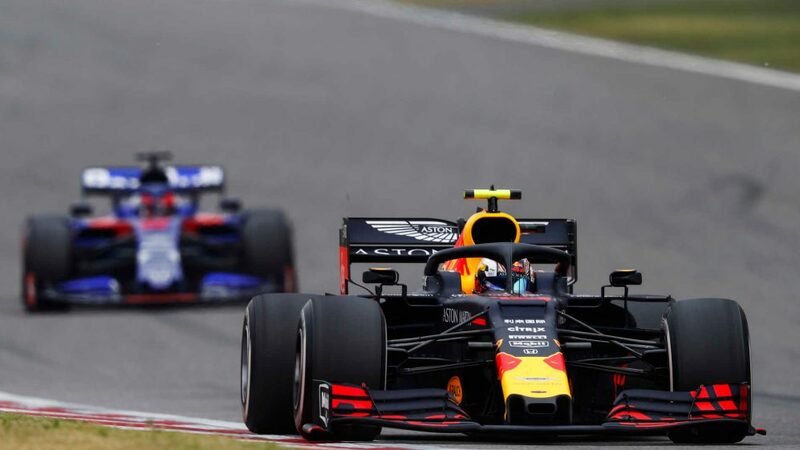 The drivers and teams head to the Black Sea resort of Sochi in two weeks’ time for what will be the fifth Russian Grand Prix in the history of the Formula 1 World Championship. Mercedes have got a perfect record around the Sochi Autodrom – but Sebastian Vettel will be desperate to disrupt that record and try and yank himself back into contention for the 2018 title.